When we talk about creating a connection with your customers, the first place to start is to learn more about their demographics – their age, gender, income level. For us to talk about connecting with your customers using hashtag marketitng, we’re going to dig down deeper. I want you to look at the psychographics of your customer. I realize that’s a big fancy word but it’s really pretty simple. Psychographics actually refers to the breakdown of values, interests, behavior and lifestyle of your loyal fans. I understand what it’s like to be a small business owner. I’ve owned my company since 1999 and I know how important it is to make the best use of your time. You have a limited schedule available to be online so why waste time clicking, commenting and updating on all the social programs? Get to know and understand the psychographics of your fans and your connections will grow stronger allowing you to convert them into loyal customers. Start thinking about how your product fits into your target’s lifestyle. Ask yourself, how do my customers use my services? Is your product seasonal or do they only call you when something is broken? What is their buying patterns when it comes to clicking on the checkout button for your stuff? Learning something like what age your customers are will help you decide which audience to target but discovering the lifestyle and online behavior of your target market will impact the driving force of their buying patterns. By now you already know that I’m going to tell you to go online and do some research. And of course, my next sentence is going to be: Check your competition and see where they’re spending their time online. Most likely, they’re using the social networks where most of your customers hang out. Take a look at how many fans they have and how much engagement they’re getting from their posts. If they’re doing consistent informational posts and you’re not seeing much activity on their sites, this could give you some insight into whether this particular social network is a good place for you to spend your valuable time. Hashtags are everywhere. If you don’t know what they are, take a look at any of the social programs and search for a word or phrase with the number sign like this # in front of it. An example of a hashtag would be #hashtagslooklikethis. 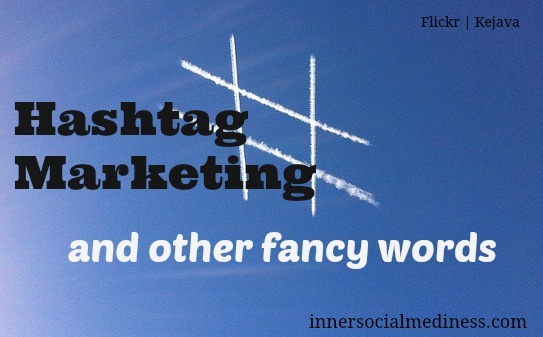 The Gen Y crowd have been using hashtags since they realized that #hashtagsarecool. Facebook gives so much importance to hashtags now that they all get their own URL like Facebook.com/hashtag/#keywordname. Frequently used hashtags are insights into your customer’s psychographics. (Hey, look at that … I just went full circle and pulled that big science word back in!) The big thing you need to know about hashtags is that they’re a way to unite people with their interests, behaviors and lifestyles. Try to do a little research and see what you find. Go to the social network where most of your customers hang out and run a search for your company’s keywords. You may not find all of your keywords as hashtags but the ones you do find will give you a tremendous amount of information. This information will be like finding the answers to the questions you’ve been asking. Click on the hashtag and you’ll find a list of conversations and discussions from your target audience all in one place. A little hashtag marketing can go a long way. Hashtags let you see what your customers or potential customers think are the top issues or trends. Think about how you can use this information when you’re creating your content for your social posts. Throw in a keyword hashtag or two to your posts and you’ll see how you can be a part of a conversation instead of just watching the comments go by. PS Are tips like these helpful to figure out your social media marketing? This is one of things you’ll learn in my new Strategy Builder workbook — that will be available THIS FRIDAY November 1st! It’s an easy to follow marketing strategy workbook that will give you marketing secrets like this one to create successful social media campaigns. Click here to enter your email and get notified about the launch discount deal for the Strategy Builder workbook.